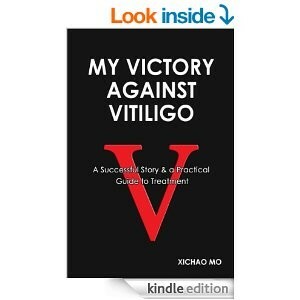 Today I am pleased to share with you an interview with Xichao Mo, author of My Victory Against Vitiligo . Xichao has managed to stop and reverse his vitiligo. I hope you find his interview helpful. Enjoy ;)! Xichao, when and how did your vitiligo start? I cannot recall exactly when it first happened, but I remember seeing very faint spots long before I went to see a dermatologist five years ago. The first stubborn patch appeared on my left eyebrow, where I had a little surgery when I was 18. It was stable for about two years, and then started to spread on my forehead, nose, cheek, and neck. What do you feel caused or triggered your vitiligo? I suspect the issues of my digestive system were behind it in the beginning, as I had odd bowel movements for a year before the onset. Then I also suspected the prolonged sun exposure being the trigger. After collecting more information recently, I am now more convinced that my problem was associated with the digestive issues. This is also supported by the treatments that contributed to my recovery. Did you change your diet? If so what changes did you make? I eliminated certain food items and also took supplements that would balance the bacteria in the gut. Food elimination, in my opinion, is a passive measure when you are still trying to fix digestive tract issues (such as leaky gut), the ultimate goal should be fixing the gut issues so you don’t have to eliminate food items. I actually didn’t know it was important; instead, I stumbled into the decision to eliminate food items when things got worse after a trip to my hometown, where the cuisine is totally different. Once I stopped eating certain foods, things got better. Later, a casual conversation with a doctor friend led me to check into candida overgrowth, so I started to take probiotics and raw garlic, also. Have you used any supplements? If so, which ones? I have used B12, folate, zinc, copper, probiotics, etc. What topical treatments have you used to help you repigment? I first used Elidel and sunlight. Later I also used NBUVB and Protopic. What do you feel was most important to your success? I feel the diet change was very critical, and the topical treatment accelerated my recovery. How long after these changes did you see results? For some reason, my progress was relatively slow. It took me more than three months to get noticeable improvement, and a year to heal. I had lesions that were more stubborn than others. I suspect this may have something to do with my skin quality and blood circulation. I read Healing Psoriasis: The Natural Alternative by Dr. John Pagano recently. It is not about vitiligo, but it will open your eyes. Actually, psoriasis, eczema, and vitiligo have a lot in common regarding their root cause, and most of the drugs for vitiligo are also used for psoriasis and eczema. The sections talking about leaky gut are especially interesting to read. When you see the patients that have recovered from this condition (much worse than vitiligo) simply by diet and natural therapy, you will believe that diet has a lot to do with, and can be used to heal, skin disorders, including vitiligo. Another is The Immune System Recovery Plan by Susan Blum. I only went through the table of contents, but I saw useful information that matches my experience, so I plan to get a copy soon. I didn’t know about these two books until I published my own and started checking the Amazon best seller list. I was surprised to find out that the things I wrote about digestive issues, leaky gut, and diet management were strongly supported by these books. My plan is to put in more operational information on these subjects in the second edition of my book, My Victory Against Vitiligo. What advice would you give to someone who wants to reverse their vitiligo? Where should he or she start? I personally think getting well educated on this special condition is very important. A lot of people simply give up hope because some pessimistic and irresponsible doctors told them to. If a person doesn’t have a strong will to win, then he could easily lose focus when things are not working as expected. I know it is hard for a person to be positive when the spots are spreading, but we need to stay focused. I also think it is important for a person to scrutinize all his health issues, especially the ones associated with his digestive system. Some of them are behind vitiligo. Learn as much as possible about the conditions and the treatments available. Read other people’s successful stories and learn from their experiences. I believe the answer and the solutions are out there, it takes collective efforts to figure them out, and I believe the sufferers could actually do a better job than the doctors if they work together with a system, perhaps by using the cloud to share information. Even a research doctor has only a limited amount of time to listen to the patients, but the people who suffer from the condition could actually spend most of their spare time thinking about it. My Victory Against Vitiligo has been regularly on the top 20 of the Amazon Best Seller rank in skin ailments since its release in February 2014. I have been in contact with a lot of other people who are affected by this disorder and have been getting a flood of new information. There some issues that interest me a lot so I still continue my study on this project. One issue is vitiligo in children. I have been contacted by a few readers whose young children suffer from active, quick-spreading vitiligo. They have tried everything available and the progress is still slow. I suspect something is different for cases in young children so I would like to collect more information on this subject. In addition, I want to have a better understanding about why the lesions on hands and feet seem to be more difficult to heal for a lot of people, and why the same medication could have a drastically different response among different patients. I want to understand these better so I can provide more helpful information for other people in the second edition of the book. Click here to read other vitiligo success stories. My wife and another family member both suffer from vitiligo. 10 years ago my wife and I went to India back backing for 3 month, during that time we came across a clinic claiming that it could cure vitiligo through a ayuveda treatment. It seem to work. A couple of my wife’s patched on her pelvis regained pigment and the larger patches under her arms stopped spreading. When we returned home it was hard to keep up the diet but my wife conciously does her best to eat healthy and organic food. Her vitiligo has been stable ever since. 4 years ago we were blessed with the birth of our 1st child. An súper active, aethleticaly gifted and happy boy who by all accounts is fully healthy. A couple of months ago we noticed a white spot under his armpit and now we see faint depigmentation on top of a foot and knee. What action do you recommend we take ? 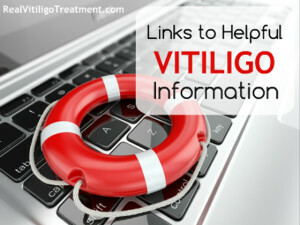 Do you know of any success stories of treatments or diets for children with vitiligo ? How would treating a child differ from treating an adult ? Is there any additional diatry concerns to consider ? We would love to hear from anyone who maybe able to help or advise. 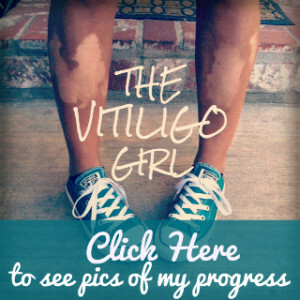 For your son, I would recommend reading Emily’s Vitiligo – it’s free. It will give you a lot of insight. I would also highly recommend you see a holistic or naturopath doctor and get some blood work done to check thyroid and adrenal function and test for celiac. As far as supplements, I am not a doctor so I cannot say, but a fish oil and vitamin D3 supplement would be good for him to start with. I actually give these both to my four year old son. Also, I would get him off of gluten right a way for the reasons mentioned in this post – http://realvitiligotreatment.com/low-stomach-acid-vitiligo-need-know/. Dairy can be problematic too, so I would eliminate that also and replace with a calcium/magnesium supplement. Again I am not a doctor, so please check with a doctor before making these changes. I hope these suggestions help, they are just a basic starting point. Please fell free to contact me with any other questions you may have. Thanks for taking the time to visit the blog and comment! John, could you please say what treatment your wife underwent and how your son is doing right now? I have a 7 year old who has vitiligo, it started when he was 3 and a half. For the past one year it is spreading really fast. We also tried an Ayurvedic treatment one year back, bought from India. It spread fast and when contacted they said it will initially spread then subside. But after 4 months, we let it go. It would really help to hear from you. Thanks. What is the progress of your son condition?? Also all stories are called successful because you reversed it or accepted it?? What is the average rate of spreading patches?